Roofing problems got you down? Call Home Remedy LLC. Residential roofing is one of the home remodeling and repair services offered. At Home Remedy, we specialize in the professional installation of top-quality roofing materials throughout the greater Houston area. We also can assess and repair roof damage caused by rain, hail, wind or any other type of damage. We offer several styles, textures, qualities and colors of roofing materials and the work of our roofing professionals is backed by a guarantee. Estimates and referrals from other projects are available. Most people in the Houston area do not put too much thought into their residential roofing. Unlike floors, walls, electrical wiring, plumbing, and climate control, we do not actually see the roof very often, or for very long. But our roofs are always hanging over us, keeping out the elements, and, of course, a house would hardly be a house without one. Sadly, no roof lasts forever, and after many years of rain, wind, ice, and sunlight, it will inevitably need to be replaced. If you need a new roof, you will face many decisions, and it is important you get them all right. This is true of any aspect of home remodeling in Houston, but especially so with the roof, since it is such a major project. So before the work can even get started, you need to be sure that you know what you want. Slate roofs carry an unmistakable air of stateliness, even grandeur. They can also last a long, long time. But all this does come at a price, and slate is quite expensive. Therefore, slate roofs have become rare sights these days. On the other hand, some reasonable imitations exist, made of rubber and plastic, and though they will not last as long as the real thing, they are still quite strong. 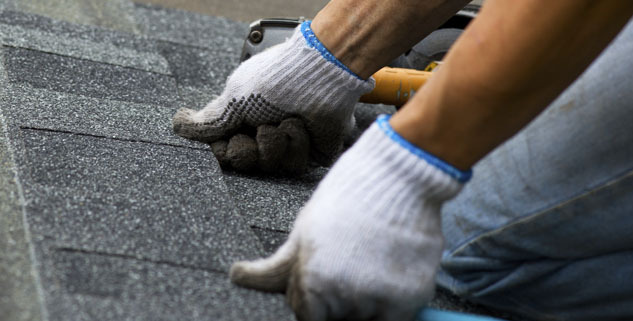 By far the most common form of roofing used in new housing construction today, asphalt shingles have two main advantages: affordability and variability. A roof made of asphalt shingles may come in a great variety of colors and look like wood or like slate, but for a fraction of the cost. They may not be the most glamorous option, but they are sturdy and affordable—making them the default choice for a new roof. Mediterranean-style roofs made with ceramic tiles can be gorgeous on the right house. They are also extremely long-lasting and resistant to damage from ice and water. However, both the materials and the intense labor required to properly install a ceramic-tile roof mean that this is the most expensive roofing choice of all, on average. Ceramics are so strong, though, that the high price may be worth it. You will not need to replace it for a very long time—often the better part of a century. Wood is a classic choice, for understandable reasons. A properly-constructed wooden roof can be a thing of beauty, and one that ages well. Common types of wood used in roofing include cedar, redwood, and southern pine, but these are far from the only options. Wooden roofing materials come in two forms: shingles and shakes. The difference between them is that shingles are smooth and uniform, while shakes have a “rougher” quality to them that makes a home look more rustic. The downside of wooden roofs is that they are not the cheapest of options. Another serious issue is the fact that wood burns. In fact, many places now have strict limitations on the use of wood in roofing construction because it presents a fire hazard. Some wood is treated so that it is fire-resistant, but this will be more costly. If you live in the Houston area and are looking to replace your home’s roof, Home Remedy can help. We can also help you tackle other home remodeling projects in Houston, such as bathroom remodeling, window and siding installation, and general handyman work. We offer free estimates for most projects.